Loopita is more than just a conversation piece; it has been conceptualized as the notion of a space where people interact, becoming a semi-intimate lounge for two, creating a seductive concept that intrigues people with its simplicity and exquisiteness. 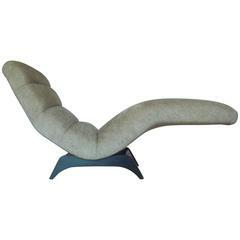 Milo Baughman 1970's round chair or saucer shape chaise lounge on a walnut plinth meticulously restored and reupholstered in a cream color mohair. Black leather and steel chaise lounge designed by Tord Björklund.